308 Winchester cartridges have a maximum overall length of 2.800” while the 30-06 Springfield has an overall case length of 3.340”. That is a difference of a little bit over a half of an inch. The Warsaw Pact forces have used 3.038” long 7.62x54mm cartridges since 1891 though it should be noted that the firearms chambered for this cartridge have always been bolt action rifles using stripper clips, a few specialized semi-auto rifles or belt-fed machineguns. Perhaps a study was done at some point that determined the maximum size magazine that could be handled reliably by the average-sized person. Having shot the HK91 extensively, I can attest to the fact that a 308 Winchester magazine is about all that I can handle. There was a magazine-fed 30-06 Springfield rifle, the BAR, which stood for Browning Automatic Rifle. This was a large rifle carried in infantry units as a type of squad automatic weapon that combined the fire support capability of a machinegun with the mobility of an infantry rifle. Of course, there was compromise involved in this—the BAR is a beastly gun to carry if you are in shape. It is probable that this was discovered early on in the fielding of the BAR and work concurrently began on a rifle cartridge to duplicate the performance of the BAR as closely as possible using a smaller overall rifle. So where does this leave the civilian gun owner and recreational shooter? There are many great choices in 308 Winchester rifles that can be had for a reasonable price. The M14 clones are smooth shooting as is the Kel-Tec RFB and FN SCAR. I have shot the HK91 in the past and I recommend that you be in good shape and if you are going to be using the ‘paratrooper stock’, you should be ready for discomfort to your face due to weapon recoil. All of these rifles are more expensive and heavier than the equivalent 5.56mm versions. Additionally, the ammunition capacity will be reduced. It is rare to find a 30 round magazine for a 7.62x51mm rifle but it is routine to find one for a 5.56x45mm rifle. You will have to be more accurate with the 7.62x51mm but this is harder to do because the gun kicks more and costs more to buy practice ammunition. 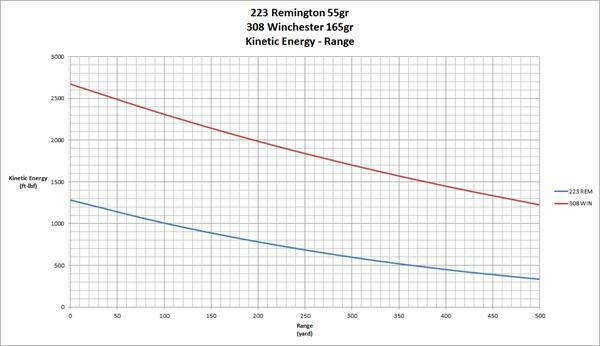 However, if you can score a hit with your 308 Winchester, the damage will be much greater and extend to further distances than if a 223 Remington was in use (see Figure 1). At 500 yards, the 308 Winchester has the same kinetic energy as a 5.56x45mm at the muzzle. I recommend shooting ones rifle at 500 yards to get an idea for the difficulty in hitting targets at this distance. If the target can be hit, however, even at this range the lethality of the 308 Winchester is significant.